Before preparing this wrap I wasn’t sure how it will taste. Maybe my photography for this one isn’t that great but it tastes really well. This being a vegetarian, really surprised me with its taste. It tasted well for sure. Even the non vegetarian relished this vegetable wrap. It is nutritious for sure. Grill the tomatoes till the skin turns black. Peel the skin. Do not wash.
Puree 4 tomatoes and chop 2 tomatoes and mix them. Heat a pan with butter. Saute onions till transparent. Add the tomatoes. Saute for 2 minutes. Add salt, pepper, oregano, ketchup and vinegar. Keep aside the salsa. Heat butter. Saute all the vegetables together. Season with salt, pepper and oregano. Keep aside. Heat the tortilla on both sides. Spread salsa. Wrap the tortilla into 3 folds. I am sure you would Enjoy the wrap!! Living in Delhi involves a lot of social commitments. Easily we end up eating outside meals at least three times a week. This is then followed by stomach issues. So whenever I can, I try to avoid the outside spicy food. So I prefer to replicate the restaurant dishes at home in a healthy way. 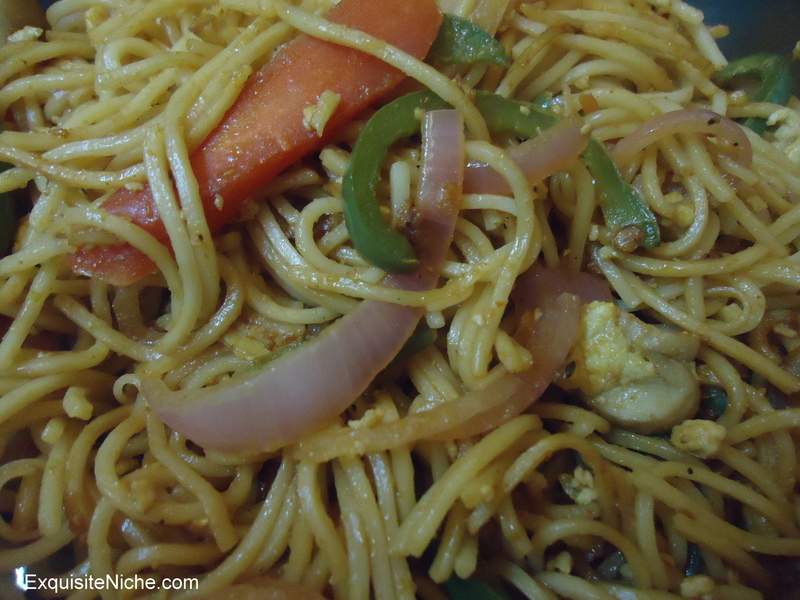 Recently, I just craved to have nice vegetable stir fried noodles. After having some Teppanyaki food on a our anniversary we relished the taste of egg in rice and noodles. Before this I have never tried putting egg in home-made noodles and rice. I tried with noodles this time and it worked really well. This is my own recipe. I like it when I follow my instincts and the recipe works well. 🙂 It is indeed very satisfying. Boil 5-6 cups of water, add some salt and oil. Add the noodles. Let them cook for 7 minutes. Strain them and add some oil so it doesn’t become sticky. Soak the dried red chili’s in a bowl of water. Keep aside for 10 minutes. Heat a pan. Add olive oil. Saute garlic till it becomes aromatic. Add the soaked chilies. Now add carrots, capsicum and mushrooms and french beans. Saute till they get cooked properly. Push the vegetables a little aside in the pan and add the egg to the same pan and scramble it well with a wooden spatula. Once the egg is cooked properly combine it with the vegetables (it may look a bit messy but once you combine with noodles it will become fine). Add the noodles. Stir them properly. In a small bowl, mix the soya sauce, red chili sauce, vinegar, pepper and salt. Add it to the noodles. Mix well and serve hot! !